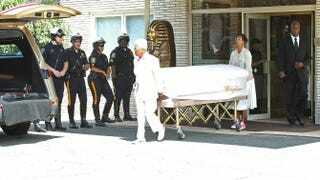 The body of Bobbi Kristina Brown leaves Whigham Funeral Home after a funeral service Aug. 3, 2015, in Newark, N.J.
On Wednesday the National Enquirer published a photo on its website of Bobbi Kristina Brown lying in a hospital bed. They say it was taken right before she died July 26. The Enquirer claims to have additional photos of a deceased Brown that readers can access if they buy the latest issue of the magazine. This is just the latest on a list of eerily similar things that happened to both Whitney Houston and her daughter. The National Enquirer ran a photo of Houston lying in a coffin at her funeral in 2012 that sparked outrage among her family members and the general public. And that Enquirer hospital photo may not be the last we see of Brown. According to a recent report by NewsOne, a photo of Brown lying in her coffin was reportedly sold to a news outlet for $100,000. Brown was recently laid to rest right next to her mother in a New Jersey cemetery. News organizations should show some respect and not print any more photos of the deceased, especially without the consent of their families.